Anyway, this week I want to continue the theme of “University education”. I know, it might be boring, for those that are more interesting in travel (pictures, yay! ), conferences (pictures of people, yay!) and gossip… err, news from the world of science, don’t worry, plenty of travel coming up for me in the next few weeks. Even as we speak a conference on integral field spectroscopy in galaxy surveys is happening right now, so I’m keeping my eyes and ears open for that one. However, last week we had another 2 days of workshop relating to “Testing and Mentoring”. Combined with the fact that over the summer with a professor colleague and mentor we’ve been grading some oral presentations and testing some students one-on-one (well two-on-one to be precise), this was quite pertinent. Yesterday we had two oral tests scheduled. These are usually 20-30 minute affairs. The subject for these particular tests related to basic astronomy concepts, we ask you about a subject for about 8-10 minutes. We go deeper and deeper with the questions until either the time is up or we find a barrier, where you might need some “hints” or “encouragement”. The theoretic construct behind it is quite similar to Bloom’s taxonomy of learning in the cognitive domain. In terms of didactics it is basic stuff and probably you have done it yourself subconsciously, but I wanted to put it up on the blog for me as a reminder, too. The table is by Donald Clark from this website: http://www.nwlink.com/~donclark/hrd/bloom.html. It also has links to the original research paper and further reading on the subject. Knowledge: Recall data or information. Examples: Recite a policy. Quote prices from memory to a customer. Knows the safety rules. Key Words: defines, describes, identifies, knows, labels, lists, matches, names, outlines, recalls, recognizes, reproduces, selects, states. Comprehension: Understand the meaning, translation, interpolation, and interpretation of instructions and problems. State a problem in one’s own words. Examples: Rewrites the principles of test writing. Explain in one’s own words the steps for performing a complex task. Translates an equation into a computer spreadsheet. Key Words: comprehends, converts, defends, distinguishes, estimates, explains, extends, generalizes, gives an example, infers, interprets, paraphrases, predicts, rewrites, summarizes, translates. Application: Use a concept in a new situation or unprompted use of an abstraction. Applies what was learned in the classroom into novel situations in the work place. Examples: Use a manual to calculate an employee’s vacation time. Apply laws of statistics to evaluate the reliability of a written test. Key Words: applies, changes, computes, constructs, demonstrates, discovers, manipulates, modifies, operates, predicts, prepares, produces, relates, shows, solves, uses. Analysis: Separates material or concepts into component parts so that its organizational structure may be understood. Distinguishes between facts and inferences. Examples: Troubleshoot a piece of equipment by using logical deduction. Recognize logical fallacies in reasoning. Gathers information from a department and selects the required tasks for training. Key Words: analyzes, breaks down, compares, contrasts, diagrams, deconstructs, differentiates, discriminates, distinguishes, identifies, illustrates, infers, outlines, relates, selects, separates. Synthesis: Builds a structure or pattern from diverse elements. Put parts together to form a whole, with emphasis on creating a new meaning or structure. Examples: Write a company operations or process manual. Design a machine to perform a specific task. Integrates training from several sources to solve a problem. Revises and process to improve the outcome. Key Words: categorizes, combines, compiles, composes, creates, devises, designs, explains, generates, modifies, organizes, plans, rearranges, reconstructs, relates, reorganizes, revises, rewrites, summarizes, tells, writes. Evaluation: Make judgments about the value of ideas or materials. Examples: Select the most effective solution. Hire the most qualified candidate. Explain and justify a new budget. Key Words: appraises, compares, concludes, contrasts, criticizes, critiques, defends, describes, discriminates, evaluates, explains, interprets, justifies, relates, summarizes, supports. So this taxonomy of learning is generally quite helpful in devising goals for your lecture, you might want to start at the very beginning which is pure knowledge base and let the students end up doing their own judgements about the current state of knowledge (uh… something like research 🙂 ). Here is an example of how that would work on something simple like Kepler’s laws. Remembering: Cite the three laws, write down the formulas. Understanding: Draw a picture with the planets relating to Kepler’s law. What is an ellipse? What is the semimajor axis? Where is the focus? What is meant by enclosed area? Applying: Ask a simple extrapolation question or a small calculation. For example: if the velocity of a planet circularly orbiting the sun at a radius r is v, what would it be at 2r? Analyzing: Extrapolate Kepler’s laws into other parts of astronomy. For example, Pluto’s mass was only calculated when its moon Charon was discovered in 1978. How? Why? Which one of Kepler’s laws would you use for that? Evaluating: A bit more general, the student needs to gather knowledge from other lectures and/or formulas to make judgement calls. How are Kepler’s laws relevant in the motions of stars around the center of the galaxy? Why would they not necessarily apply? What needs to be considered for something to have “Keplerian motion”? What kind of rotation curve would you expect for a star having Keplerian motion around the center of the galaxy? What does it mean that galaxies show flat rotation curves? Creating: Write a proposal on exactly the research on stellar motions in the center of our galaxy that the Andrea Ghez’ and Reinhard Genzel’s groups have been doing in calculating the mass of the black hole there. Obviously the last two points would span too much time. They would be much more part of a homework, perhaps a final project – but there have been exceptional students that you can sort of lead into the thinking behind even in an oral examination. What is important is that you can see in this simple example how the taxonomy grows and how you find interesting questions to lead you through the oral exam without making it a simple question-answer game. This applies to written examinations as well – the trouble (for the examiner mostly, lol) comes when the first point is not there, but there is all sorts of knowledge about the latter points. Anyway, now that you have the test all set up, you’re all prepared, you have trained yourself in the mannerisms of the presentation, you want to appear professional, but positive, you have a glass of water ready, some pen and paper – everything for the student and you to have a conversation, you need to grade the test. I also have to say that the workshop itself last week was utterly boring and the teacher was a bit incompetent. He brought a lot of knowledge to the table, but I felt he couldn’t apply it. It is weird, because it’s now the second week, I’ve complained about the lecturer on this blog, but the first training sessions relating to didactics at University were really good. I guess I was pampered and now have quite high standards. We also had the misfortune that due to scheduling conflicts our group turned out to be quite small and filled with teachers of the natural sciences (physicists, chemists, biologists, etc.). As such, some of us were actually yearning for more structure… more truths… I mean, yes we acknowledge there is personality in every subject, even in math, but the teacher as a psychologist was almost set out to invalidate any fact presented as absolute truth. Ah well, it’s not easy teaching scientists :D. I got a lot of great insights by my fellows, though. How they deal with things, certain situations familiar to all of us. Plus the anecdotes, oh the funny test answers (if you have any fun ones, please do share! ), the logically impossible excuses (the fifth death of a grandmother in a semester). It was a nice respite from my overly research driven activities around me at the moment, but alas, now it’s back to QUASARS! Last week I attended another round of teaching resource courses within the “Senior Teaching Professionals” program. The program is designed to help people in their early teaching phases, like postdocs and junior professors to become better and more efficient educators within today’s modern university. So far I have really enjoyed the program and the people attending. It is refreshing to meet people from all sorts of disciplines, but also grounding to hear that so many problems we have with students are similar. It also fills me with joy that they generally like teaching and that they also find the positive response of a few students such a gratifying reward that it makes them go on. This week we talked about E-Learning and E-Teaching. While in the past the courses associated with the “Senior Teaching Professionals” have been top notch, I can’t say that with this course. Nevertheless it gave me a lot to think about and it even inspired some new ideas I might use in some lectures. So let’s get quickly the things I didn’t like out of the way. The professor mentoring us this time was an old web pioneer, having worked on the development of HTML at CERN with Tim Berners Lee. Having spent his 15-year stint in the New Economy, he returned to academia a few years ago, where he now deals with the web in education. So for those amazing credentials his course was quite chaotic. There were a lot of buzz words, but not that much substance. Also some… well… shall I say, outdated concepts in my mind, like second life (seriously? 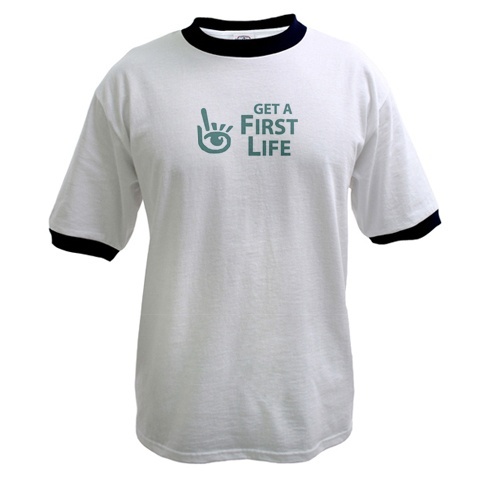 My husband does actually own the T-shirt pictured on the right from the now defunct getafirstlife.com). He did mention that not all e-tools are applicable for all lectures, e.g. a blog instead of a final written project is just not doable in subject like math and physics, where typing in the LaTeX formulas can be much larger hassles for beginning students that what the communication aspect is worth. However, I feel he should have shown successful blog examples instead of directing us to WordPress and encouraging us to “play around”. – I was not yet acquainted with the MOODLE platform we have at our University, but we thoroughly introduced it and its functionalities during the first day. It offers ease of use, all the necessary tools preinstalled and automatic / immediate access for all students enrolled in your course. The drawbacks are that the interface is a bit outdated (no drag&drop for wikis e.g.) and well, that it is a closed environment in which nobody from outside will ever be able to access it. I think it is a powerful platform that can be immensely useful, but probably not one I will use in my class, since I don’t have any fears of, say, installing a forum or wiki platform on my homepage. – The main point of the professor was communication. But in my mind it goes beyond that, it’s about accountability to your students. To give them the opportunity of acquiring the best information out there if they wish to do so and to give them the tools to do that. Be it in the simple stuff of putting your lectures online and linking to interesting and relevant articles to the idea of giving them the opportunity to confer amongst themselves when I don’t have the time to respond to every e-mail or inquiry. – Lots of people have spent an enormous amount of time and energy in putting the resources out there and most of them are free. Now it’s up to you to figure out if they will be applicable – that is the challenge! In the days where udacity and coursera are perhaps shifting the paradigm of learning online, we need to remember to never among all blogs, wikis, forums, hangouts, etc. forget that the personal communication makes for the real “aha-moments”. So among all accountability don’t forget offline accessibility either. What will I implement in the end? Beyond putting lectures, homework problems and solutions on the web? I think a summary in the type of a wiki for the lecture would be good, maybe with a comment function. That way the student can help point out a relevant article or something I missed, but he/she can also gripe about something. Please, connect with me, leave comments, write me on my various interfaces; I try to be as accessible as possible. I will probably NOT apply much of social network things beyond that, (un)fortunately our advanced astrophysics classes are small enough that I can invite you for a coffee for anything needing discussion beyond a quick comment blurb or link.